A femoral fracture is a break in the thigh bone, which is called the femur. It runs from the hip to the knee. It is the longest and strongest bone in the body. It usually requires a great deal of force to break the femur. Older adults are at increased risk of femoral fracture. Stress fractures occur slowly over time with repetitive motion. A dull ache rather than severe pain may be felt when applying weight to the leg. Sometimes pain may be felt in another part of the leg, such as the knee. You will be asked about your symptoms, physical activity, and how the injury happened. The injured area will also be examined. Extra support may be needed to protect, support, and keep the femur bone in line while it heals. Supportive steps may include a splint. A walker or crutches may be needed to keep weight off the leg. Casts are rarely used except in young children. In most cases, surgery is needed to repair a femoral fracture. Prescription or over-the-counter pain medication may be advised to relieve discomfort. Healing time varies by age and overall health. Children and people in better overall health heal faster. In general, it takes up to 4-6 months for a fractured femur to heal. Activities will need to be adjusted while the femur heals, but complete rest is rarely required. Ice and elevating the leg at rest may also be advised to help with discomfort and swelling. Physical therapy or rehabilitation therapy will be used to improve range of motion and strengthen the leg. 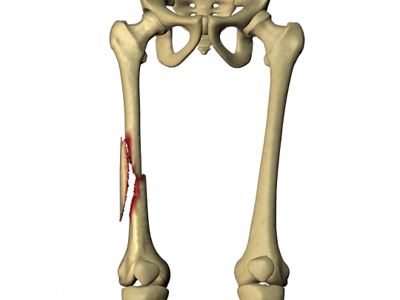 Femoral shaft fracture—emergency management. EBSCO DynaMed Plus website. Available at: https://www.dynamed.com/topics/dmp~AN~T910561/Femoral-shaft-fracture-emergency-management . Accessed August 30, 2017. Femur shaft fractures (broken thighbone). Ortho Info—American Academy of Orthopaedic Surgeons website. Available at: http://orthoinfo.aaos.org/topic.cfm?topic=A00521. Updated August 2011. Accessed August 30, 2017. Femoral stress fracture. EBSCO DynaMed Plus website. Available at: https://www.dynamed.com/topics/dmp~AN~T115016/Femoral-stress-fracture . Updated March 20, 2017. Accessed August 30, 2017. What are ways to prevent falls and related fractures? National Institute of Arthritis and Musculoskeletal and Skin Diseases website. Available at: http://www.niams.nih.gov/Health%5FInfo/Bone/Osteoporosis/Fracture/prevent%5Ffalls%5Fff.asp. Updated November 2014. Accessed August 30, 2017.